Royal Events by Melissa & 6 Lounge invite you to a Cocktail Reception/Business Networking event to raise funds for breast cancer awareness. 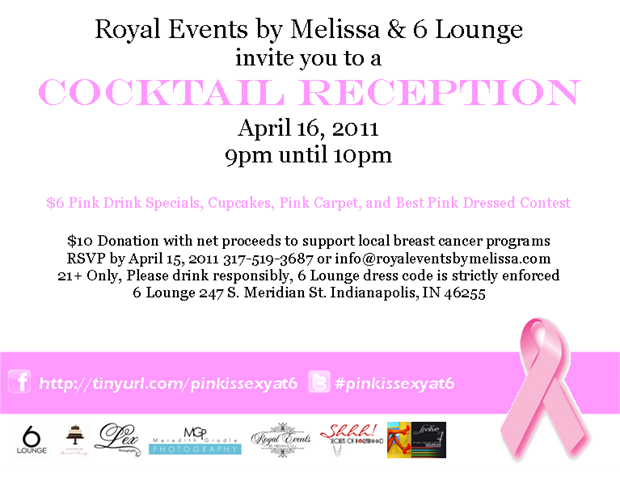 It will be April 16, 2011 from 9pm until 10pm at 6 Lounge 247 S. Meridian St. Indianapolis, IN 46255. $6 Pink Drink Specials, Cupcakes, Pink Carpet, and Best Dressed Contest.